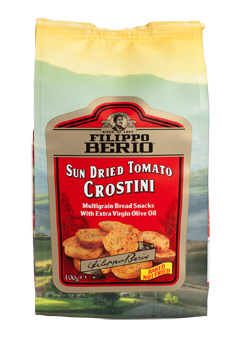 Discover the delicious taste of Filippo Berio’s Multigrain Crostini snacks. Inspired by our favourite Italian flavours,and made with freshly baked multigrain bread, these sun dried tomato flavoured Crostini are then drizzled with our signature Filippo Berio Extra Virgin Olive Oil. Because they’re baked, not fried, our Multigrain Crostini are lower in fat*, but still with an addictively delicious taste. Bursting with flavour, Filippo Berio Sun Dried Tomato Crostini are perfect straight from the pack, with dips or as a special treat with drinks. Store in a cool, dry place away from direct heat and sunlight. Once opened store in an airtight container.